Wasn’t the theory supposed to be that greater contrast between polar and equatorial climates meant greater weather disturbances, due to larger adjustments having to be made by the climate system? In other words, colder poles should mean more and/or greater weather upsets. That the promotion of alarm does not follow from the science, is clearly illustrated by the following example. According to any textbook on dynamic meteorology, one may reasonably conclude that in a warmer world, extratropical storminess and weather variability will actually decrease. The reasoning is as follows. Judging by historical climate change, changes are greater in high latitudes than in the tropics. Thus, in a warmer world, we would expect that the temperature difference between high and low latitudes would diminish. However, it is precisely this difference that gives rise to extratropical large-scale weather disturbances. Moreover, when in Boston on a winter day we experience unusual warmth, it is because the wind is blowing from the south. Similarly, when we experience unusual cold, it is generally because the wind is blowing from the north. 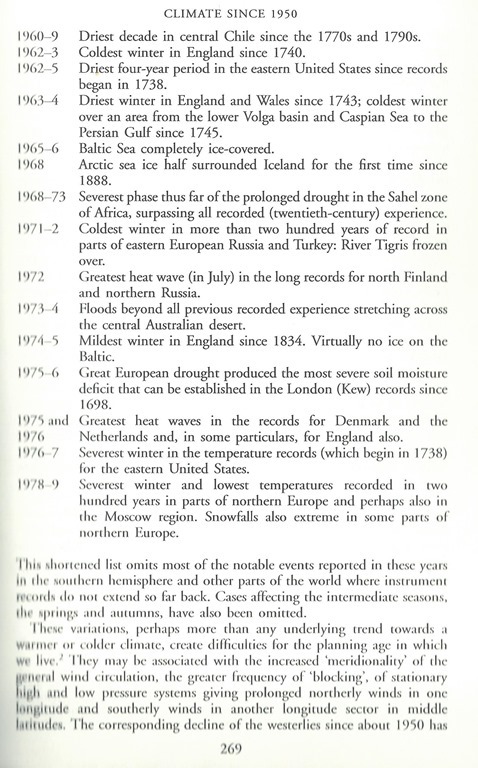 The possible extent of these extremes is, not surprisingly, determined by how warm low latitudes are and how cold high latitudes are. Given that we expect that high latitudes will warm much more than low latitudes in a warmer climate, the difference is expected to diminish, leading to less variance. Nevertheless, we are told by advocates and the media that exactly the opposite is the case, and that, moreover, the models predict this (which, to their credit, they do not) and that the basic agreement discussed earlier signiﬁes scientiﬁc agreement on this matter as well. 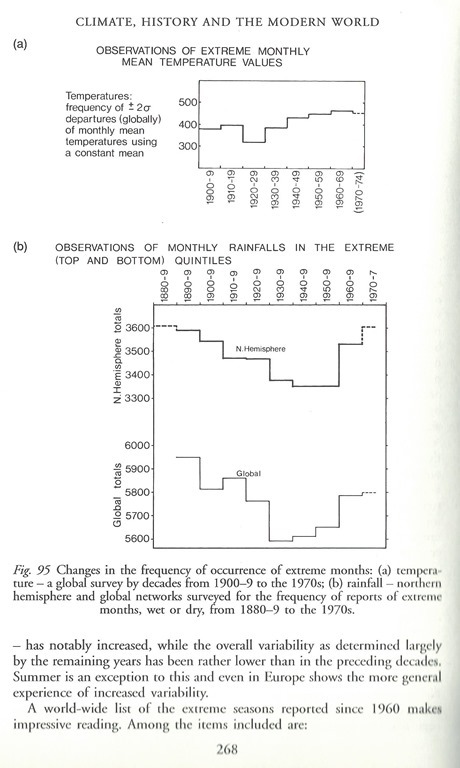 Clearly more storms and greater extremes are regarded as more alarming than the opposite. Thus, the opposite of our current understanding is invoked in order to promote public concern. There is a difference between THUNDER storms and CYCLONIC storms. A (sufficiently) warmer world might well have more of the former, but less of the latter. It follows that there is a heavy burden of proof upon anyone who says that he has experienced enough weather to announce a change in climate. I have been searching for this book for ages and even the Kindle one is £40. Reblogged this on The Road to Revelation. Isn’t the corollary of this that if, as is claimed by alarmists, extreme rainfall events are increasing then despite adjusted global temperatures going up or pausing the world is actually cooling? It would seem so, by contraposition (i.e. asserting the contrapositive). ‘B is false’ implies that A is false.